My reverse lights don't work, but now my trunk is claiming to be open. It isn't. Brake and regular rear lights work fine so I'm guessing the trunk and reverse lights share a wire. Somewhere there must be a brake since the fuse is new as are the bulbs. This isn't a hatch, either. Does anyone know which wires it could be and where they come in from in the trunk? Okay, I'm new to Fords, and my car is a hatch, so I can't check things for 100%, but every door/trunk/hood open indicator that I've ever seen is a single wire which connects to ground to indicate that the door/trunk/hood is open. A break in that wire will NEVER indicate that the trunk is open it will prevent the car from knowing when it is open. The only way that these indicate that something is open when it isn't is if the wire is shorted to ground. This can happen where the wire goes near a hinge, or a pinch point. 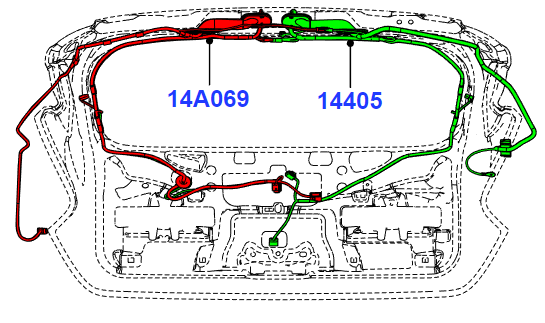 Check near the trunk hinges for damage to the wiring harness, particularly if something looks squashed. Close to the hinge point is the most likely place to find such damage. This might be from having something in the trunk that disrupted the normal pathing for the wire harness. The reverse lights could have been damaged at the same time, they will go through the same wiring harness. Or the dmaage could have become worse. If the positive wire lead to the lights got shorted as well, you would probably blow fuses. If you have a backup camera, it could also be affected. Last edited by Smalls89; 03-03-2019 at 11:01 AM. Thanks. Good to know where all that connects and how much it is. I found the spot where the wires are broken. THREE wires are broken, black and white, black, and another black. Why Ford did it that way is beyond me. I reconnected the black and white wire with the crimping tool I have and hopefully it's connected right, but the two solid black ones, I have no idea which is which. It's like 20 degrees outside so I could only stay out long enough to do one. If I had more room and knew which was which I'd just solder them together. Have you by any change changed these harnesses? I'm wondering how hard it is to do. I know it's not technically difficult, but I mean the routing and all. From what I know of the hatch, the trim is the hardest part. 2 screws and it all snaps off, but it snaps easier if you do them at the same time. All three pieces (3 on the left, 3 on the right) overlap in a continuous ring. As far as the sedan? I would think it would be the same except I piece trim on either side inside the trunk if that.